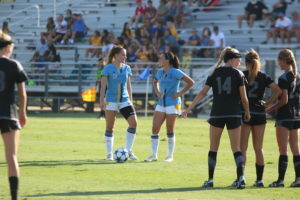 Coming off a scoreless draw against Utah Valley University, CSU Bakersfield earned a 2-1 win on senior night against Air Force on Oct. 24 at the Main Soccer Field. 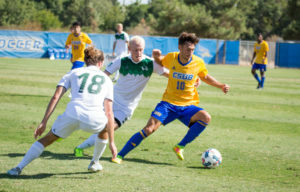 CSUB senior midfielder Christian Duarte opened the game up in the second half with a goal in the 53rd minute from the top of the box off an assist from sophomore defender Jamie Carey-Morrell. 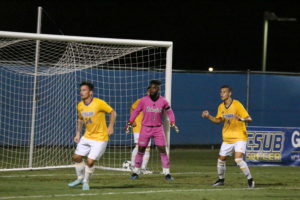 The Roadrunners got their second goal off a header in the 81st minute by senior forward Simon Doherty from an assist by Morrell, which was his second of the game. 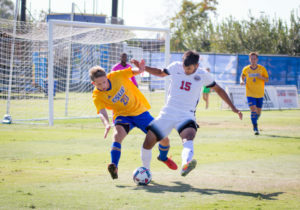 Seconds later, the Falcons fought back and also scored in the 81st minute from a header by sophomore forward John Sims off a cross from senior forward Zach Hill. This put the Roadrunners back on their heels and made them defend what they had left to prevent the Falcons from making the game even. “We were really disappointed to lose the goal after we wrapped it up at two nil. 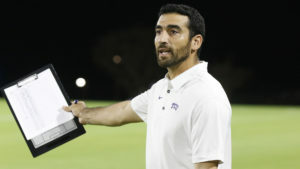 That’s something we’ll have to address in training,” said coach Grant. Both teams were very physical as the Roadrunners got five yellow cards (Morrell, Duarte, senior midfielder Brian Celis, junior defender Danny Corral and junior midfielder Brian Charles). 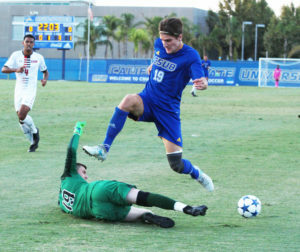 The Falcons physicality earned them a red card for junior midfielder Tucker Axhoj who was sent off for the foul. 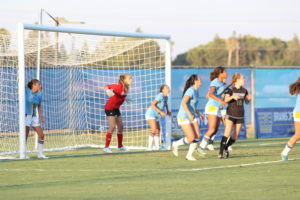 This is just the second conference win for the Roadrunners (5-4-4, 2-2-2 Western Athletic Conference) as they are looking to secure a top six spot in the conference to get into the WAC tournament next month.